After nearly a decade of “blue sky” thinking and demonstrations of only laboratory prototypes, last week’s Printed Electronics USA & Photovoltaics USA 2011 conference and tradeshow in Santa Clara, CA, brought out plenty of real-world examples of working technology, some of which are truly printed and flexible. Perhaps the busiest spot on the show floor was Demonstration Street—a hub of active displays for commercialized products, including some cool packaging. Based on research by organizer IDTechEx, the global market for printed and potentially printed electronics this year is $2.2 billion. Right now, sales of thin-film photovoltaics (aka solar cells), OLEDs (organic light-emitting diodes) and e-paper displays are growing rapidly, followed by thin-film transistor circuits, sensors and batteries. By 2021, the firm predicts the market will be worth $44.25 billion, with 56% of products printed and 43% on flexible substrates. Commercially, the most prominent success has clearly been E Ink, the company behind e-paper that has been in use for e-readers such as the Amazon Kindle and B&N Nook. That market has tripled every year since 2006 and now accounts for $180 million in sales. IDTechEx forecasts that worldwide e-reader sales will top $2.1 billion by 2017. Making an appearance at PEUSA 2011 was the next stage in flexibility and convenience for e-readers: A rollable e-paper display from Polymer Vision (see above). The 6-in. SVGA display retracts to a 6-mm roll radius, uses a thin-film transistor backplane and SiPix media. It has been tested to roll up and unroll 25,000 times. Reportedly, it will go on sale early in 2012, allowing you to take your e-reader along in your pocket. 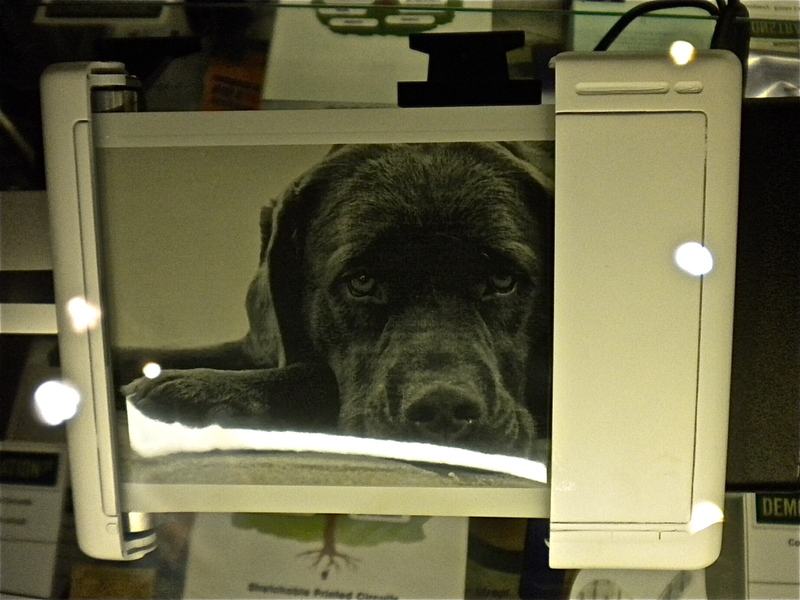 A resistive touchscreen panel made with a Kodak transparent conductive film and featuring completely invisible conductive patterns was demonstrated for the first time at PEUSA 2011. The polymer-based, 14-in. 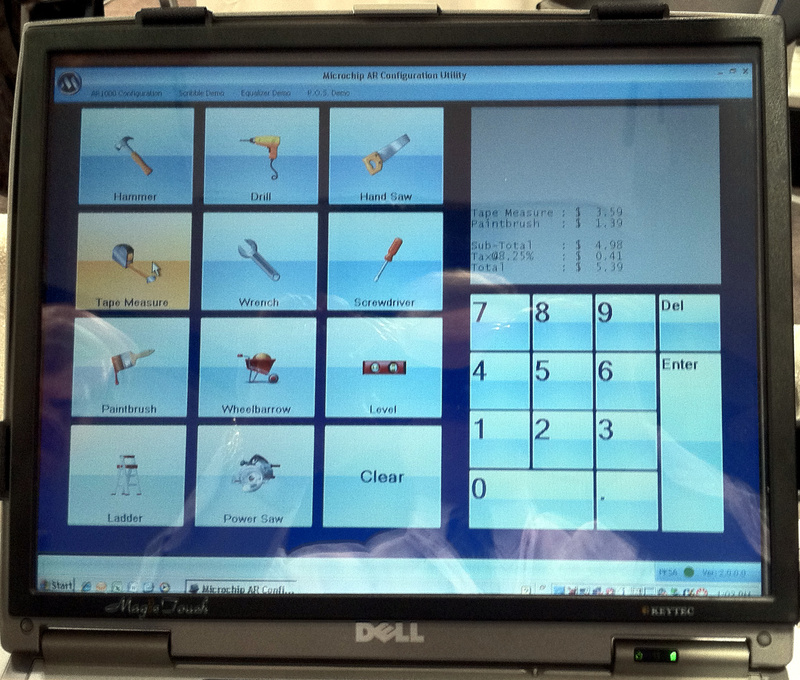 touchscreen panel was fabricated by GSI Technologies LLC and features Kodak HCF-225 film/ESTAR™ Base and Clevios™ PEDOT:PSS coating from Heraeus Precious Metals GmbH & Co. KG with a surface resistivity of 225 ohms/sq. It was built using conventional printing processes, including UV-cured and heat-processed inks. The companies have experimented with a variety of films and formulations to create a touchscreen that provides superior performance, flexibility, stability, transparency, neutral color and low haze at an economical price as an alternative to Indium Tin Oxide (ITO). New technologies such as this are expected to capture up to 20% of the touchscreen market from ITO-based systems, Heraeus says. Vorbeck Materials and MeadWestvaco Corp. teamed up to create a better security package. 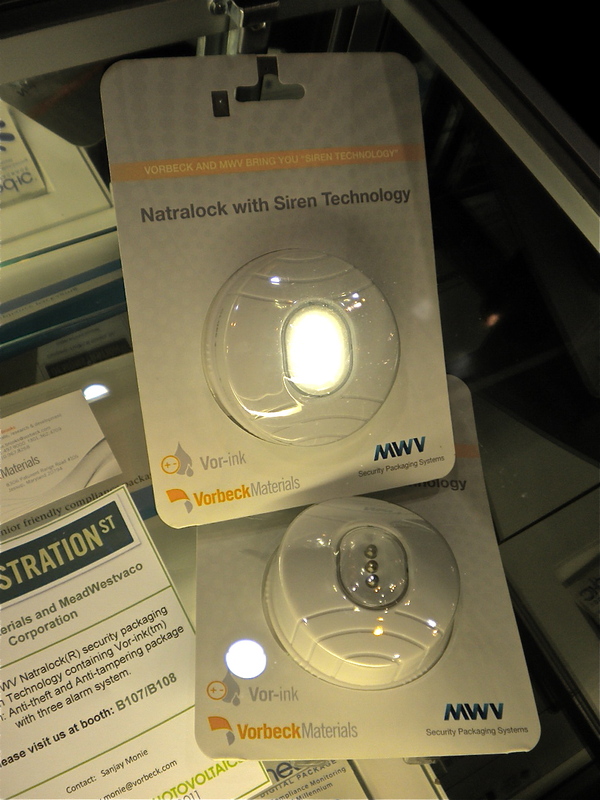 It unites MWV’s Natralock®–a durable, tear-resistant paperboard card with a thermoformed plastic blister protecting the consumer electronics product from theft or tampering—with new Siren three-alarm technology that employs Vor-ink™ conductive ink. Together, the new packaging eliminates the annoying spider-wraps typically used as anti-theft devices for high-end products at the retail shelf. Natralock’s paperboard can contain up to 30% recycled content. 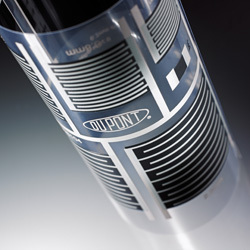 DuPont Microcircuit Materials displayed its latest silver conductor material—DuPont 5064H ink, which is said to provide resistivity less than or equal to 6 milliohms/sq/mil, making it among the most conductive and cost-effective screen-printed, silver conductor material. DuPont 5064H allows thinner prints of conductor traces on a variety of substrates, including PET, PEN, DuPont™ Kapton® polyimide films, and paper. With a solvent-based composition, the ink is designed to be screen-printed in semiautomatic or high-volume roll-to-roll applications. DuPont also highlighted its new low-temperature processing Solamet® PV414 photovoltaic metallization paste, designed for rotary screen printing for high-speed R2R processing of thin and flexible solar cells. Thin Film Electronics ASA announced a partnership with Polyera, a developer of high-performance functional materials for the flexible, printed electronics industry. The two companies will jointly develop organic semiconductor materials for high-volume printing of Thinfilm Addressable Memory™ and printed integrated systems. The collaboration hopes to bring printed integrated systems, such as smart sensor tags, closer to commercial availability by co-development of gravure-based ink formulations for use in high-throughput printing equipment. Polyera’s work on n-type organic transistors has paved the way for printed CMOS circuits—more energy-efficient logic circuitry with simpler design, says their press release. Using Polyera materials, Thinfilm and PARC, a Xerox Co., recently demonstrated a prototype of the world’s first printed non-volatile memory device addressed with complementary organic circuits—the organic equivalent of CMOS circuitry. 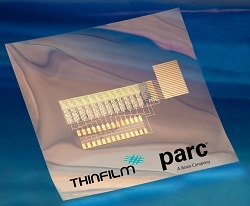 Thinfilm Addressable Memory combines Thinfilm’s polymer-based memory technology with PARC’s transistor technology using complementary transistor pairs to construct the circuits. The addition of integrated circuits makes the roll-to-roll printed Thinfilm Memory addressable by printable logic. Toyo Ink America LLC introduced Rexalpha™ conductive inks and electromagnetic interference (EMI) shielding films. Rexalpha conductive silver inks are said to offer ultra-low resistance properties and low curing temperatures of 100 to 130° C, for faster curing times and superior printability. Compatible with rotary screen, flat screen, flexo and gravure, Rexalpha inks can be used to fabricate flexible printed circuits (FPCs), RFID-label antennae and EMI shields. Made from a proprietary urethane formulation Toyochem’s EMI-shielding films can protect sensitive electronic devices from electronic interference. The shielding structure is reduced to two layers versus the conventional four-layer design, resulting in a 22-μm post-press thickness of the shielding layer. This entry was posted in coating/laminating, labels, package printing, paper/paperboard/cartons, printed electronics and tagged converting, flexography, gravure, ink, labels, packaging, paper, paperboard packaging, plastic film, printing, renewable energy, solar cells. Bookmark the permalink. Thanks so much for the shout-out, Mark. Hoping you are happy and well.